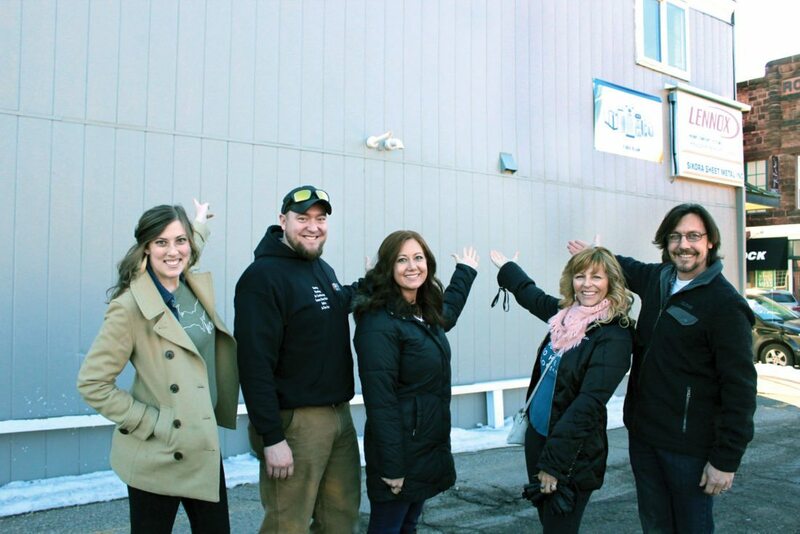 IRON MOUNTAIN — Downtown Iron Mountain can expect a little more color this summer when Mia Tavonatti returns to the area to create two more wall murals as part of a regional expansion of her Power of Words Project. The Iron Mountain Downtown Development Authority and the Svelata Foundation recently announced Tavonatti plans to work in June on the south facade of the 535 S. Stephenson Ave. building and the west facade of the Lenox/Sikora Sheet Metal building at 216 E. Hughitt St.
They’ll join the first Power of Words Project mural “Believe,” done in 2013 on the west facade of the Blackstone Pizza Co. building at 207 E. Hughitt St., and the “Community” mural on the west side of The Daily News building, 215 E. Ludington St. The second mural, completed just last summer, contains portraits of 89 local community members and a child astronaut, “symbolic of the future potential of the community,” Tavonatti said. “These murals have drawn visitors from around the country and continue to be tremendous cultural assets to the Iron Mountain Downtown District,” the Iron Mountain native added. The community again is invited to participate in the creative process by voting for a word online that defines the future of Iron Mountain. The first 25 words nominated will be posted on the website and community members are encouraged to cast a vote for best word. To vote, go to www.powerofwordsproject.org. Voting will be open until April 10. The Lenox/Sikora Sheet Metal building at 216 E. Hughitt St. will be the site for one of artist Mia Tavonatti’s 2018 Power of Words Project murals this June. 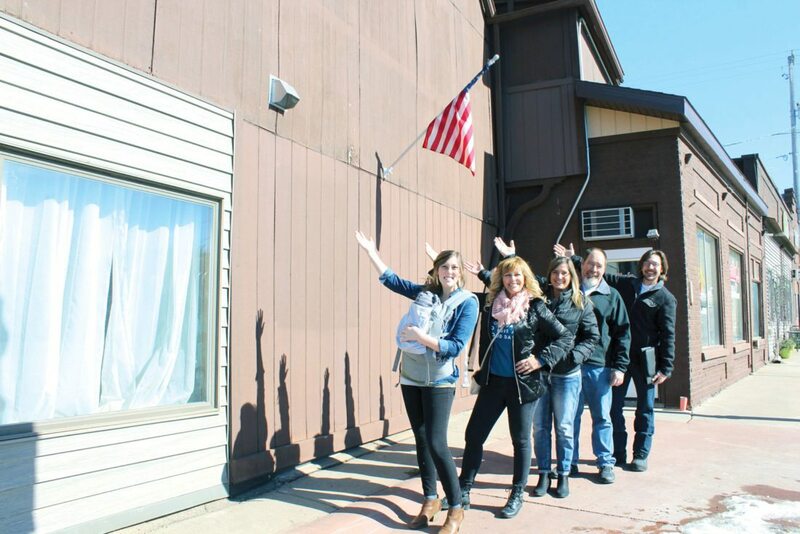 From left, are Iron Mountain Downtown Development Authority Director Paula Craven, building owners Craig and Angela Harris, Tavonatti and local artist Jeff Gurchinoff. Funding for the 2018 projects comes from an Artplace grant recently awarded to the Central Upper Peninsula Planning and Development Regional Commission, or CUPPAD, as well as local corporate and individual sponsorships. With the funding received from the Artplace grant, the Power of Words Project will be expanding into a regional initiative called Uplift. This initiative will include additional mural projects in Manistique in July and Gladstone in August. All Power of Words Project funds raised go toward materials, travel, lodging, food, wall preparations, promotion, grants for local artists and scholarships for local art students who work side-by-side with Tavonatti and her team of professional artists in these mural creations. To learn more about the project, go online to the Power of Words Project website at www.powerofwordsproject.org. Those who want to be involved with the project or become sponsors can contact Iron Mountain DDA Program Director Paula Craven at 906-774-8534 or Paula@downtownironmountain.com, or Tavonatti at mia@svelata.org.